Yes, darlings, it’s that time of year again — when the world’s top designers descend on Manhattan to show off their fancy fall ready-to-wear collections on the some of the world’s most rarefied runways. This year’s Mercedez-Benz Fashion Week, as it’s officially called, runs from this Thursday, Feb. 6 through next Thursday, Feb. 13. Events take place all over the city, but most of the action takes place at Lincoln Center. Kate Spade, Nicole Miller, Helmet Lang, Diane von Furstenberg, Victoria Beckham, Tommy Hilfiger, Zac Posen and Oscar de la Renta are just some of the 80 bold-faced names who will be peddling their wares for retail buyers, the fashion press and the general public. Click here for a full schedule of events. A Calvin Klein outfit from 2013. Christian Siriano’s collection from 2013. 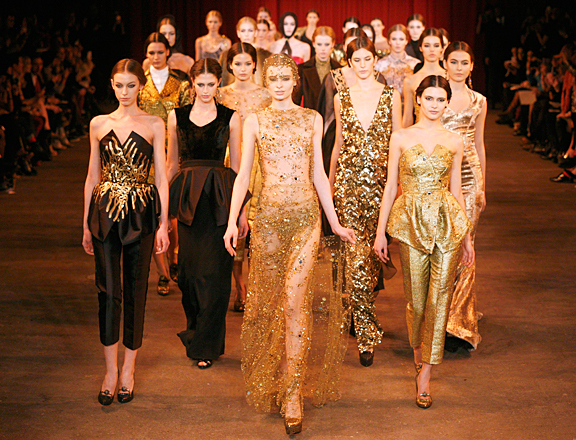 As highfalutin as it may seem, New York Fashion Week boasts rather patriotic origins. The first New York Fashion Week, known as “Press Week,” was organized by fashion publicist named Eleanor Lambert in 1943. It was designed to draw attention away from the French fashion industry during World War II. Buyers were not admitted to the shows, and instead had to visit designers’ showrooms. Press Week proved to be a smash, and fashion magazines like Vogue, which were normally filled with French designs, increasingly began to feature American designers. Even today, Mercedes-Benz Fashion Week primarily showcases American or New York-based designers, with a sprinkling of designers from Australia, England, Spain and Russia joining them. While the runway shows are not open to members of the general public, there are a multitude of public events for fashion lovers all over the city, especially in and around the the city’s Garment District. New York Magazine’s got the most extensive list of these, and Edison ParkFast has a number of locations right in the heart of the Garment District. And if you’re more of stay-at-home clotheshorse, the Huffington Post has given us a list of the 43 Instagram accounts you should be following this week. And if you wind up buying more gowns than you have room for, you can always find extra closet space at a Manhattan Mini Storage near you. See you on the runway, sweetie.